Spread across three hills overlooking the crescent-shaped Mirabello Bay, Agios Nikolaos is a picturesque and cosmopolitan seaside resort. By day, visitors flock to the beaches, while at night, patrons fill chic waterfront restaurants and bars in the harbor and Voulismeni Lake—connected to the harbor via a narrow channel. Agios Nikolaos’ lively yet low-key atmosphere appeals to many visitors that use the town as a base while in Crete. During the day, most vacationers head off on foot to one of the town’s beaches. The small stretches of Ammos and Kytroplatia are conveniently located in town, but tend to fill up quicker than Ammoudi, Havania, and Almyros, situated to the north and south of town. Come evening, join local Greek families strolling along the waterfront before enjoying dinner at a lakeside restaurant. Some visitors combine a visit to Agios Nikolaos with a trip to Santorini’s volcano and a dip at the natural hot springs in Palea Kameni Island. Agios Nikolaos is a must for beach lovers and souvenir shoppers, with lots of artisanal crafts for sale in the town’s boutiques. Rent sun loungers and umbrellas at any of the town’s beaches. While some hotels, restaurants, and streets in Agios Nikolaos are accessible, other parts of town present a challenge to wheelchair users with steep curbs, stepped entrances, and uneven surfaces making navigation difficult. Take a KTEL regular or express bus from Heraklion to reach Agios Nikolaos, a journey of about 39 miles (63 kilometers). Bus schedules change according to season, so be sure to check ahead before your departure. 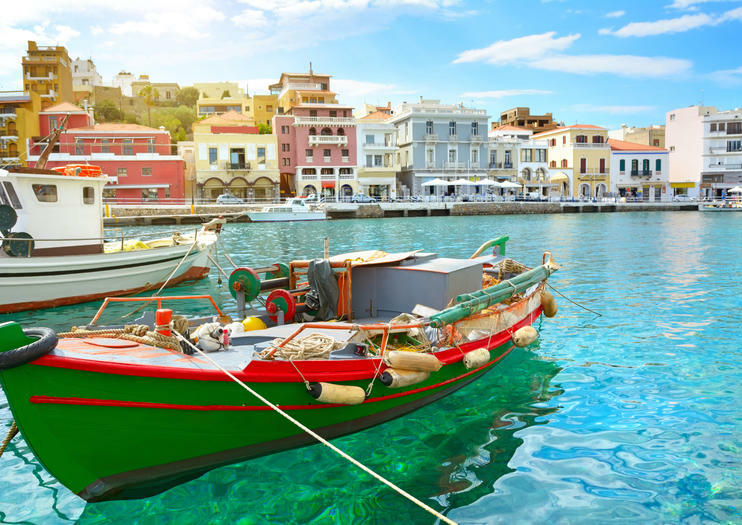 Agios Nikolaos is at its buzziest during the summer months. However, its beaches (especially those in town) and waterfront terraces can be chockablock at this time. If you visit in winter, you’ll still find many of the shops and restaurants open, and the streets uncrowded, though the water will probably be too cold for swimming and many tour operators will not be running excursions. Agios Nikolaos is well-placed, with lots of other little villages, beaches, and islands within easy reach. A short drive north is Elounda, an upscale coastal resort with an attractive harbor, where boats depart to Spinalonga, an uninhabited island that’s home to an abandoned Venetian fortress and leper colony. Also within easy reach is the whitewashed village of Kritsa—known for its traditional crafts, including weaving and embroidery—in the foothills of the Dikti Mountains. Spinalonga Island-Agios Nikolaus stad- Elounda Bay-Private Tour upp till 8 personer. Denna tur ger dig möjlighet att besöka så många platser på en dag som om det inte är med en lokal guide, skulle det vara omöjligt att besöka och hitta. Vi besöker kloster, kyrkor, Agios Nikolaus City, Spinalonga Island, Krasi Village där det äldsta Platanusträdet på Kreta hittades, vi har en traditionell kretensisk lunch i den traditionella byn Mochos där vi besöker några vackra kyrkor och i slutändan om vi har tid kan vi besöka fiskebyn Sisi där vi går för en gå på Palm Bay.